Welcome to the online sweetshop where you'll find the widest sweet treat selection around - from milk chocolate covered caramel to black licorice, chewy candy in the form of jellies and gummies to banana split toffee and rum truffles. We have old time favourites like peanut brittle and spearmint imperial mints, 70s and 80s treats such as jawbreaker chews, white candy cigarettes (now minus the red tip and called candy sticks! ), gobstopper balls and candy necklaces. If you have a sweet tooth (or you know someone else who does) then you've come to the perfect place - we're like your old fashioned, nostalgic candy filled, sweet shoppe - a modern day Willy Wonka emporium! Whether you’re reliving your childhood by choosing your old-school tuckshop favourites or you’ve decided to introduce younger generations to old fashioned sweets, A Quarter Of has everything you’ve ever dreamed of. From Flying Saucer sweets, Drumstick lollies and Popping Candy through to Aniseed Balls, Wham Bars and Anglo Bubbly Bubblegum, every memory of your youth is here for you to rediscover. Traditional sweets can be delivered as fast as the next day direct to your doorstep to either share with friends and family or to keep all to yourself as a special treat. 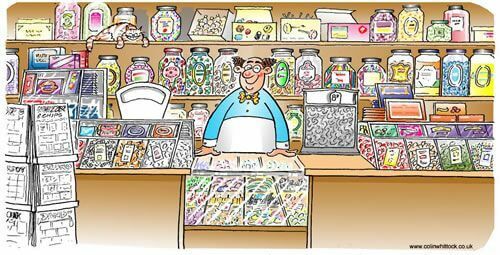 Whilst you may be too old for pocket money now, you’re never too old to enjoy the flavours and sensations of pick and mix sweets from years gone by; sweet or sour sweets, chewy or crunchy they will be sent to you picked and wrapped with love. You’ll even be able to enjoy the excitement of opening up the contents as everything comes packed either in those little white bags which used to make the trip to the sweet shop even more enticing, or our fab custom-made retro style cartoony bags. Remember wearing different types of 1970s and 80s candy jewellery... watches and necklaces? And Popping Candy that exploded in your mouth? Heston Blumenthal uses that in some of his recipes now... can you believe it? Talk about gourmet candy! Fill your basket with all your favourites today, from the brands you love, like Haribo, Barratts and Maynards... and treat yourself to a few you’ve never tried before; you’ll be back playing football on the field or making a den in the woods in your mind in no time once you receive your treasure trove of sugary delights. Welcome to our traditional sweetshop... crammed with your favourite retro sweets. You'll find all types of UK penny sweets here, from liquorice to space dust, lollies to flying saucers, boiled sweets to Parma Violets,Haribo sweets too... we've even got sweet tobacco! Plus we have some classics that are made exclusively for us - the old-fashioned sweets that you can remember from the sweet shop of your childhood, and many vintage sweets that you've probably forgotten (and those will really bring the memories flooding back, just you see). We sell most of our fab retro confectionery in 250g bags... that's over half a pound in old money, so there's plenty for you to enjoy! Plus they go down a storm on Valentines Day, at Easter (so much more imaginative than wafer-thin chocolate eggs), for Mothers Day and Fathers Day. Plus at Halloween we always have some sweets that are especially scary... perfect for your ghoulish party! And you're spoilt for choice... whatever your budget, whatever their age and whatever their taste. Pick from one of our jamp-packed retro sweet hampers (they make great Christmas hamper ideas! ), our personalised sweet jars of bestsellers - your personalised label can even include photos you upload.